SHADES OF BLACK (PART 2): YOVEL, ETERNAL SACRIFICE, AVAST, HULDREKALL, SPEKTRAL HATCHERY, S.E.K.H. It’s Labor Day here in the U.S. today, which won’t mean much or anything to half the people who visit our site. For those people, who don’t live here, it’s a holiday designed to celebrate the American labor movement. For me, it’s just another laboring day at NCS, though of course it feels more like fun than work or you can be damned sure I wouldn’t be doing it. This is the second Part of a column I began yesterday, which I hope you’ll check out if you haven’t, because there’s a lot of good music there as well as here. Although I mostly focus these columns on new or forthcoming releases, I’m stepping back in time for the first recommendation today. I overlooked this album when it was released on April 1st of this year, but was called back to it through a recent e-mail we received. The first track was seductive; the second track spun the turbine in my head into the red zone. “Hɪðəˈtu” means Break the Rock. “Hɪðəˈtu” means Escape the Loop. The band’s anti-fascist, anti-capitalist rhetoric has itself earned them attention in a “scene” better known for its notoriously regressive elements, but it’s the music here that’s even more deserving of attention. “Chapter I – Trauma” is the seduction, increasingly adamant spoken words (in Greek) over a moody yet lilting and resilient acoustic guitar melody. “Chapter II – Voices of Self” is in some ways no less hypnotic, but in other ways far, far heavier. Gloom descends through chords which transmit despondency and vocals that burn with pain, or rage. Bursts of percussive frenzy and feverish riffing gradually ratchet the tension and magnify the torment. Everything boils over… subsides briefly… burns again… champs at the bit, and races headlong. The dynamism and intensity displayed through the second track, and the contrasts between the first one and the second one, become the hallmarks of the album as a whole. Softer acoustic accents and soulful interludes are scattered throughout, as are passages of brooding, pent-up ferocity and rampant, firebrand vehemence. Tempos change frequently; one magnetic riff follows another (the album is overflowing with them); the leads jam their hooks in your head; you never escape for very long the aura of darkness that radiates from the music, but escape is the last thing you’ll want to do as this powerful album moves through its changing paces. This seems to happen to me almost every week: Despite devoting considerable time over the last 15 years to exploring extreme metal, I discover for the first time a band who’ve been around for decades. In this case, the band is the Brazilian black metal group Eternal Sacrifice, whose first demos appeared in the mid-’90s. Perhaps my previous ignorance of them was due in part to the amount of time that has passed between their albums: The first one was released in 2003, the second one in 2010, the third one coming our way later this year (September 14th). 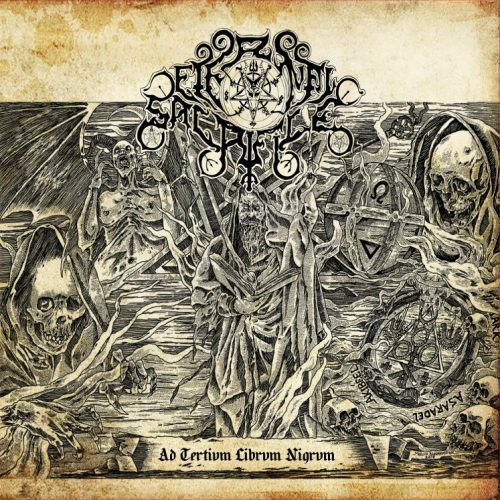 The name of the new album is Ad Tertium Librum Nigrum, and the song below is “The Emptiness, The Guard Of The Sortileges And The Time In Which The Dust Takes The Rites”. I probably would have been very satisfied if the vibrant acoustic melody (backed by rushing winds) that begins the song had continued for minutes more, but the way in which the band take that melody and elaborate upon it with heavier instrumentation proved to be even more gripping and involving. To use an overworked word, the music exudes an atmosphere of the epic — it flies higher and higher even as the tremendously impassioned vocals come in (like a cross between howls of fury and cries of pain), and there’s a mythic, otherworldly cast that comes across when pinging keyboard notes emerge as the surging tempo briefly relents. I don’t mean to suggest that this isn’t a dark piece of music — it definitely is — but it’s also mesmerizing and grand. Hard to forget, too. Ad Tertium Librum Nigrum will be released by Hammer of Damnation and Sangue Frio Productions. 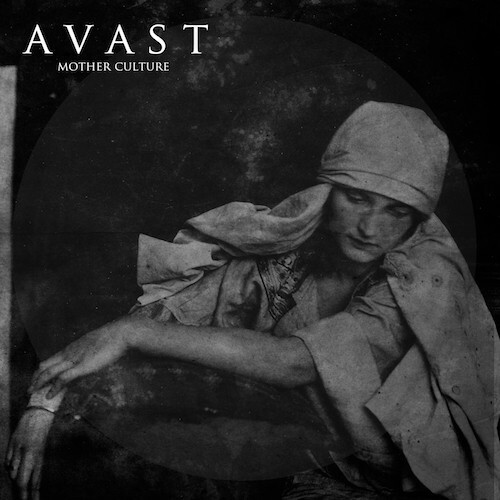 Mother Culture is the debut album by the band Avast from Stavanger, Norway, who amalgamate black metal, post-rock, and “blackgaze” with compelling results. It’s described in the press materials as “a concept album that examines the myths upon which modern civilization is based”, “a work that addresses the potential for a global catastrophe, and is based on the philosophical novel Ishmael by Daniel Quinn“. That description peaked my interest, as did the fact that it’s being released (on October 26th) by Dark Essence Records. The title track premiered recently at DECIBEL, and I was directed to it first by my Norwegian friend eiterorm. Like other songs you’ll find in this column, it includes contrasts. The rippling notes and solemn chords at the outset are dramatic and alluring; the full-throttle blasting and sweeping tremolo chords that follow it blow like strong winds; you feel carried aloft, notwithstanding the incinerating effect of the vocals. The band amplify the sweeping and soaring ambience of the song through symphonic strings, without diminishing the atmosphere of melancholy that surrounds it. It unabashedly pulls at the heartstrings, and does so with such skill that if you’re in the right kind of mood (or the wrong one), you might find a muffled sob in your throat one minute — and your head back and hands lifted to the skies the next, carried away by the majestic glory of what you’re hearing. The closing minutes, in particular, are simply wonderful. Huldrekall and Spektral Hatchery are both based in Olympia, Washington, just south of Seattle. I’ve been struck before by how good Spektral Hatchery are (see the effusive review of their 2016 self-titled debut album here), and now I know how good Huldrekall are, too — though I should have wised up sooner since they’ve released two previous albums and other splits. The new split by these two groups came out on August 18th (digitally and on cassette via Einsamkeit Tapes), featuring one track by each group, which complement each other tremendously well. 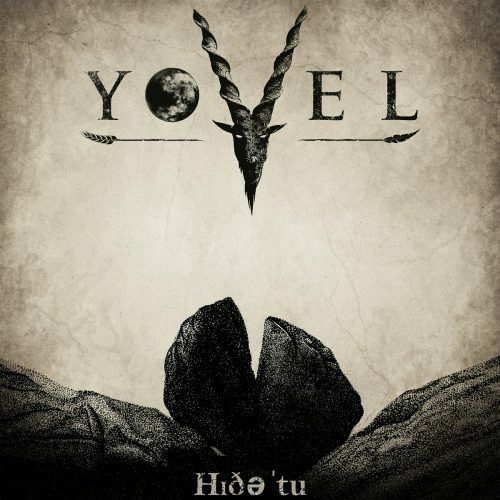 Huldrekall‘s song, “Oubliette“, is in some ways also a very fitting follow-on to that Avast track. This emotionally evocative piece surges ahead with a galloping rhythm and draws intensity from the vocalist’s wrenching extremity, but the melody soars like a hawk over shadowed mountain forests. You can feel the edge of pain in the music even then, but it becomes more pronounced later, both when the pace slows and when it accelerates, transmitting a feeling of calamitous despair as it does so. There’s also an atmosphere of bleak grandeur in the song that sweeps you out of your head, right up to the song’s haunting conclusion. 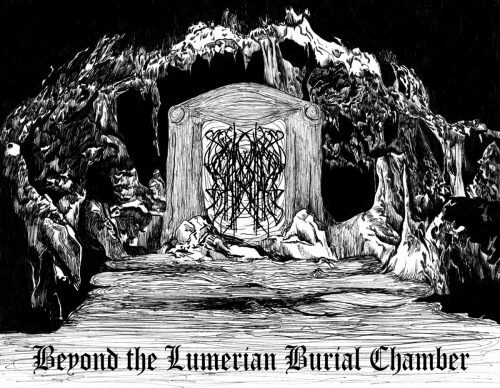 “Beyond the Lumerian Burial Chamber” is Spektral Hatchery‘s contribution to the split, and it offers no reprieve from the emotional intensity of Huldrekall‘s song. The snap of the snare drum gets your head going immediately; the vibrancy of the bass gets under the skin just as quickly, while the boiling riffs braid together feelings of warlike vehemence and terrible pain. As if the music alone weren’t enough to raise goosebumps on the back of your neck, the vocals are shattering and scalding. When the rhythm section ease up on the gas pedal, the guitar melody takes on the air of a medieval folk lament. As the ensuing chords ring out, and that voice continues its descent into a pillaging madness, there’s no escape from the feeling of paralyzing grief that comes through — though the music itself is electrifying. When you’re ready to listen to the final track in this collection: take off your shoes, wear loose clothing (or none at all), position yourself on a comfortable piece of furniture, turn off all the lights, press Play — and then close your eyes. When you open them 17 minutes later, you might have forgotten where you were at the beginning, though you’ll wish like hell that you could find your way back there. 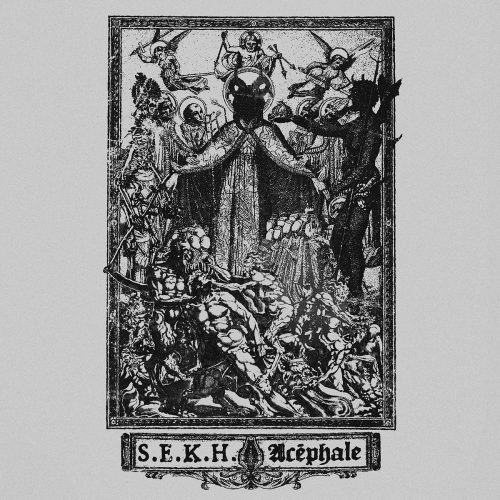 Seventeen minutes is the duration of this spell called Acéphale, a debut recording by a project named S.E.K.H. It unfolds in movements. 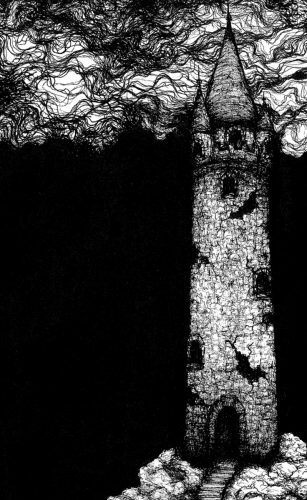 The first one is hypnotic and haunted, building slowly, with no rhythm other than a low electronic throb, and no melodic refrain other than the gradual swell and subsidence of symphonic strings, which add to the music’s ominous air of foreboding. The distant voices you hear sound like ghosts. Your wandering mind is being guided to a discomfiting realm of mist and menace. In the second movement, that realm becomes dramatically more unnerving. An immense, gravel-throated bass creates an almost industrial drive; eerie shimmering tones swirl about; horrific voices shriek and roar, echoing through this pitch-black cavernous place where S.E.K.H. has taken you; there are propulsive drum beats here and there, preternatural filaments of gibbering and glimmering melody, and other aural sensations that seem geared toward turning your sanity inside out. 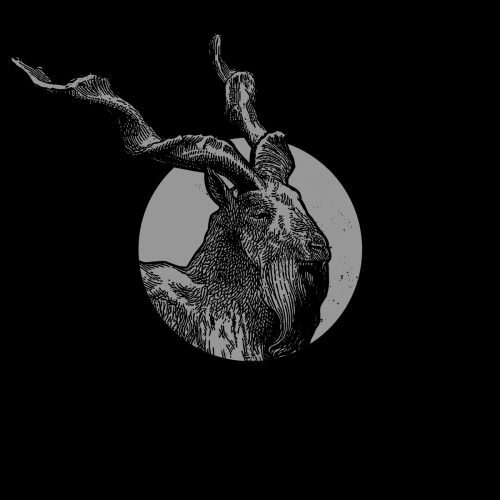 As this second movement unfolds, the low frequencies rumble like a storm, and there’s a riff that jabs and pulsates; the circling cyclone of sound builds to a feeding frenzy, with your brain as the food for whatever demonic creatures have found you. Oh, they leave a bit of you alive, only so you’ll experience the final oppressive movement, when the walls close in and the abyss opens up. Acéphale is available for pre-order now. It will be released on September 5th through a new Spanish label called The Hierophant, as a digital download and on cassette tape, “with a handmade sleeve pro-printed in a 300gsm eco-nature textured paper that folds out into an inverted crucifix with OBI and PVC sleeve”. I don’t know whether S.E.K.H. is a person or a group, and don’t know their location either. Thanks for that info. I obviously didn’t spend enough time searching.